Lions Club President Rob Mackay reports on an interesting development in the search for Houdini’s lost Voisin biplane, which is being conducted in anticipation of next year’s centenary celebrations of Houdini's first flight in Diggers Rest. "Harry Houdini shipped his biplane to England and never flew again. That year John Bevins Moisant, famous for his barnstorming, crashed a plane and so Houdini offered to help repair the damages by volunteering a replacement propeller and biplane for GRATIS. In December 1910 John Bevins Moisant died by crashing another plane. The biplane was held in storage until 1913, when a gentleman named, “Donald Stevenson” picked it up from the warehouse. Stevenson then sold it to another aviation enthusiast, who it is believed to be Chung Ling Soo, known, from a technical viewpoint, as the greatest magician of all time. Although Chung Ling Soo acted as a Chinese man, he was an Englishman named, William Ellsworth Robinson. He was also fascinated with planes and created the first model plane factory in the world." 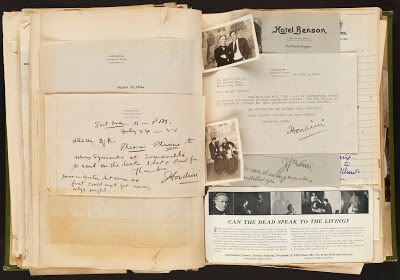 The intriguing connection was uncovered by a tipster who discovered that Donald Stevenson, who was a magician and engineer, worked in Robinson's workshop behind the magician’s home, sharing expenses. When Robinson wanted help with his magic effects, Stevenson billed him for his time. Robinson's house was a large three story brick mansion that comprised two addresses at 48 and 50 Lonsdale Road in London. Both men had a fascination with aviation and model plane building. Robinson died tragically onstage on March 23, 1918 performing the bullet catch trick. 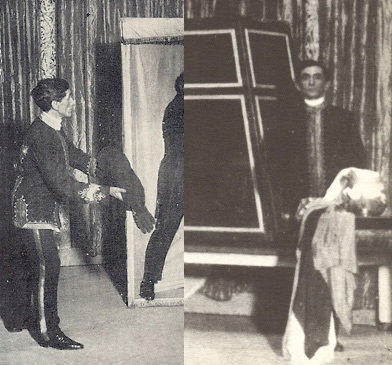 (Houdini was talked out of performing the same effect by magician Harry Keller.) 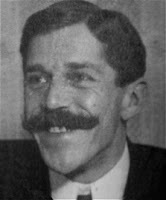 Donald Stevenson later wrote a series of articles for Model Engineering magazine, detailing his early model aviation work and connections with Chung Ling Soo. So if the Voisin found its way into the Soo/Stevenson magic and aviation collection, what happened to it after Robinson’s untimely death? USA Today reports that the sweet, syncopated sounds of Ragtime will fall silent Sunday on Broadway. The $8 million musical, which features Houdini in its cast of characters, will close after a disappointing run of less than two months at the Neil Simon Theatre. It will have played 57 performances. 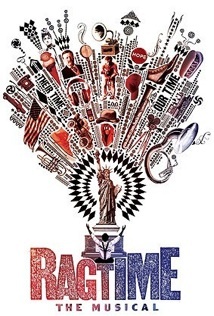 "While we're saddened and disappointed to announce that Ragtime must close, bringing this beautiful and powerful production to Broadway has been a joyous experience," lead producer Kevin McCollum said Monday." We couldn't have asked for a more talented and dedicated company and creative team or a more passionate team of producers." The ambitious revival opened Nov. 15 to generally positive notices but never took off at the box office. UPDATE: Because an unexpected boost in ticket sales, Ragtime has been extended to January 10. The Unemployed Philosophers Guild has included Houdini in their Quotable Notables note cards series. Part greeting card, part paper doll, these note cards are unique to say the least. You can order the Harry Houdini Quotable Notables card from the UPG website for $3.95, or use their store locator to find a retail outlet that carries their products. 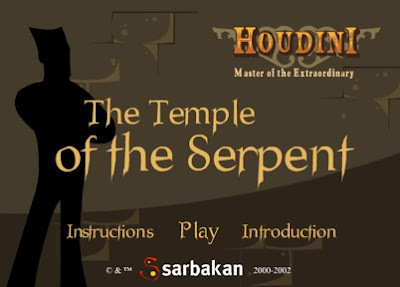 Fresh New Games has created a Houdini-themed online game called Houdini: The Temple of the Serpent. Houdini: The Temple of the Serpent is fun stuff, and slightly reminiscent of Houdini’s own Imprisoned With The Pharaohs. Houdini’s voice in a 1914 Edison recording (the only known recording of Houdini’s voice). The famous 1936 Final Houdini Seance featuring Bess Houdini and Edward Saint. Groucho Marx’s hilarious Houdini anecdote. 1937 Unsolved Mysteries Houdini radio program. 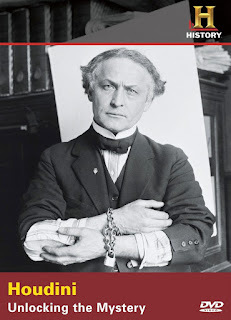 Audio recordings of Miracle Mongers and Their Methods, The Right Way to Do Wrong, The Master Mystery, and two vintage articles in audio form, “Handcuff Releases” from Scientific American in 1912 and “The Story of Harry Houdini” from The New York Times in 1918. For more information and to purchase visit The Miracle Factory website. A new retail version of The History Channel documentary Houdini: Unlocking the Mystery (not to be confused with A&E’s Houdini: Unlocking the Secrets) has been released on DVD. Houdini: Unlocking the Mystery first aired on Halloween 2005. Produced by New Wave Entertainment and hosted by Lance Burton, this doc highlights footage from the 2004 Las Vegas auction where David Copperfield bought the Water Torture Cell for $300,000. 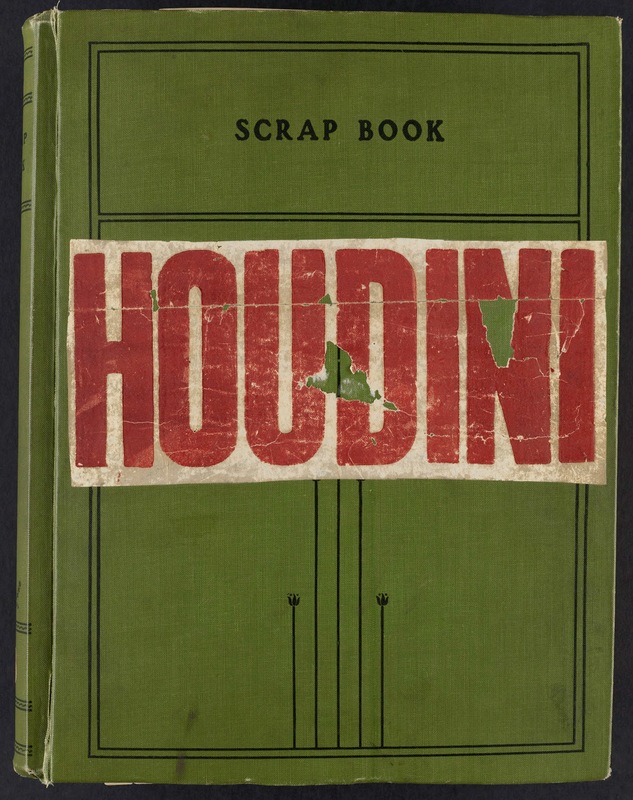 In my opinion this is the best of all the Houdini documentaries, with containing interviews with George Hardeen and even Margery's great granddaughter, Anna Thurlow. A DVD copy had been available direct from The History Channel website, but that version came with generic cover art. The good folks at the Melton Shire Council have sent us an official poster for the Houdini Centenary celebrations to be held at Diggers Rest, March 18-21, 2010. The celebrations commemorate Houdini’s historic first flight in Australia and will include a special ceremony, a Houdini-Centenary air-show, magic performances, a one-third scale model of Houdini’s Voisin, and more. Details can be found at the impressive new Diggers Rest Houdini website as well as the Melton Shire Council website. 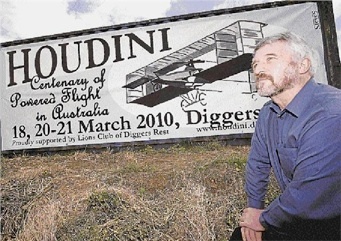 A new roadside billboard has gone up near the entrance to Diggers Rest, Australia, as part of the preparations for a massive celebration commemorating Houdini’s first flight on that continent 100 years ago. Diggers Rest resident Steve Samagalski was asked by the town's Lions Club to design the roadside billboard to mark the event. Mr Samagalski, an IT manager, was keen for the challenge, despite not having much artistic experience. The preparation of the 6x2-metre billboard involved about 40 hours of work, and took about six weeks to complete. "The expectations of the billboard were on a scale far larger than anything I had created before," Mr Samagalski said. "I presented the design to the Lions club in August and it was enthusiastically received." Mr Samagalski said it was great to be able to be a part of such a proud moment in history. "Houdini's flights in his Voisin biplane March 18, 1910, are recognized as the first officially recorded powered aeroplane flights in Australia," he said. 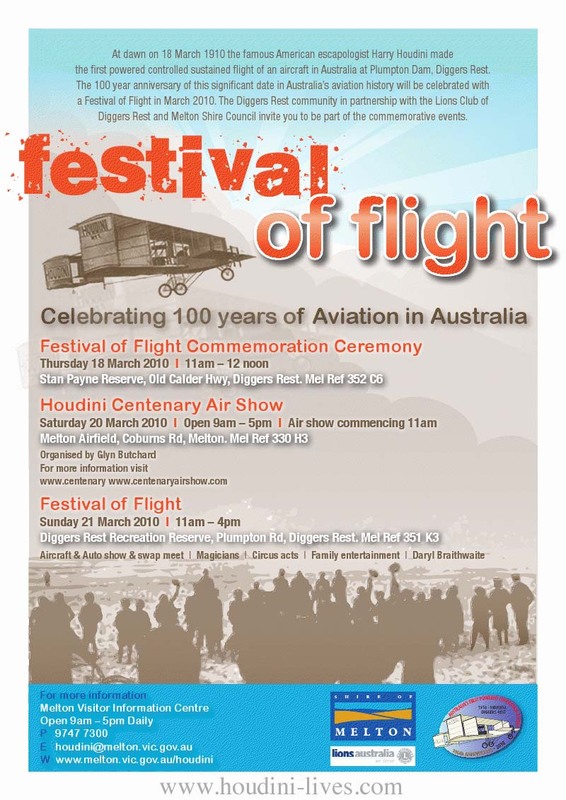 The Houdini celebrations are set for March 18-21, 2010, and will include a special ceremony, a Houdini-Centenary air-show, magic performances, a one-third scale model of Houdini’s Voisin, and more. Details can be found at the impressive new Diggers Rest Houdini website: http://www.houdini.diggersrest.com. The search for Houdini’s biplane is on! 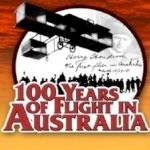 As part of the Centenary celebrations of Houdini’s first flight in Australia, the Lions Club and Diggers Rest are launching a serious attempt to locate Houdini’s lost Voison biplane -- or at least discover exactly what happened to it. 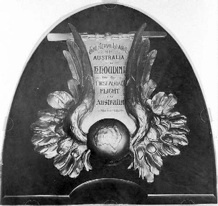 A “treasure hunt” has been launched at the impressive new Diggers Rest Houdini website asking readers to contribute information or tips that can help track the Voison following Houdini’s historic first Australian flight on March 18, 1910. 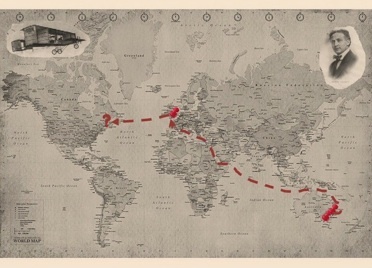 A map and timeline is being created with the hopes of tracking the plane to its final destination. Whoever is the first person to e-mail the location of the original biplane will win a bottle of Houdini Pinot Noir wine. Regardless of the outcome (the Lions Club tried to find the biplane twenty years ago when they celebrated the 80th anniversary of flight), Houdini’s Voison WILL make an appearance at the Diggers Rest Centennial celebrations in the form of a one-third scale model constructed by local resident Ian Satur. Houdini buffs are well aware of Franz Kukol, Houdini’s first chief assistant who served the great magician from 1903 to 1914. As the story goes, with the outbreak of World War I, the Austrian-born Kukol returned to his homeland to serve in the Army. 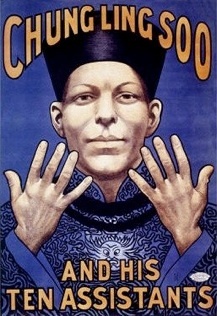 Some say Houdini fired him because of his nationality. 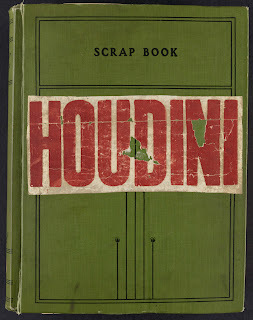 Either-way, Kukol abruptly leaves the Houdini story at the mid-point of Houdini’s career. I’ve always found this a rather sad end to what must have been a very close personal and professional relationship. Afterall, Kukol thought enough of his boss to name his son Harry Houdini Kukol (born May 24, 1909 in Austria). But now Houdini expert Patrick Culliton has uncovered what he believes to be a new chapter in the Franz Kukol story. According to Patrick, Kukol never left Houdini’s employee or his side (right to the grave). Houdini simply turned him into a new person: Frank Williamson. 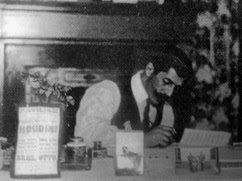 Franz Kukol at work. Photo from Houdini Unlocked by Patrick Culliton. However, Patrick notes there is some clear evidence that Kukol continued to work with Houdini, at least until America entered the War. While Houdini was playing the Maryland Theatre in 1916, a newspaper article noted: "Three of Mr. Houdini's assistants are Englishmen. The fourth is a German. 'I do not have to read the newspapers to learn about the war,' he said. 'Every once in a while I have to rescue the German from the Englishmen. They actually get to the coats-off stage in some of their arguments. It's all very funny to me, but they are not joking about it.'" Furthermore, on Sept 12, 1918, both Harry Houdini and Frank Kukol registered for the draft at the same New York office. It’s at that moment that Franz AKA Frank Kukol disappears. “I was told that the $500 bequest that Houdini left to Franz Kukol was sent to a New York address. If Franz was in New York when Houdini died, he would have to have been a pallbearer. Unless, perhaps, he was afraid of being picked up. Franz wasn't a pallbearer, but, Frank Williamson was. I thoroughly believe that Frank Williamson was Franz Kukol. Patrick points to two photos of Houdini performing his 1925/26 full evening show which show an assistant who resembles Kukol without a mustache. Says Patrick, “He is standing by the Morritt Hello Summer illusion in the Big Show Photo in the Henning book; and he is holding Vickery's severed arm in the Paligenesia photo in the Kellock book.” That assistant is identified as Frank Williamson. Is this Franz Kukol in action in Houdini's 1925/26 show? Interestingly, this is not the first time this name shows up as an alias. 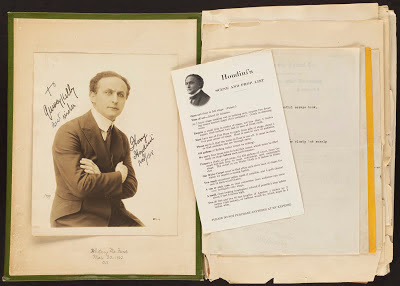 In Houdini’s Conjurers Monthly Magazine there is a letter from a Frantz Williamson of Elberfeld, Germany (Houdini frequently misspelled Franz as Frantz) questioning the origin of the packing case trick (and allowing Houdini to establish a claim on the effect). Also, in 1924, when a photo of Houdini and Teddy Roosevelt was disputed, Houdini states in a letter to R.W.G. Vail (now in the collection of Frank Saltman) that Franz will personally come to The Roosevelt Memorial Assoc. in N.Y.C. to swear he took the photos. 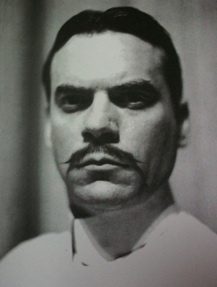 This proves that Franz was still in the U.S. and a part of the Houdini organization well into the ‘20s. UPDATE: Latest updates in the mystery of Franz Kukol. 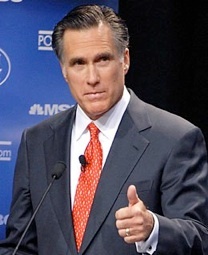 First Rush Limbaugh doctored Houdini’s King of Cards poster to show President Obama as “Barry Houdini” (I don't get it either), now presidential hopeful Mitt Romney has evoked Houdini’s name in criticizing the President’s economic policy. This appears to be a new spin on the expression “voodoo economics,” which is what George H.W. Bush called the policies of Ronald Reagan during the presidential primaries of 1980. The Boston Public Library in Copley Square has a rare Houdini scrapbook on display as part of their Cool + Collected: Treasures of the Boston Public Library exhibition which opened October 23. Cool + Collected is free and open to the public during all Library operating hours: Monday-Thursday, 9am-9pm; Friday and Saturday, 9am-5pm; and Sunday 1-5pm. The Central Library is located at 700 Boylston Street. The exhibition runs runs through February 2010. You can see more photos at the BPL Flicker page. Rosabelle is a pretty yet haunting song that definitely conjures the spirit of a by-gone age. But did you know Deborah Harry of Blondie fame and Penn Jillette of Penn & Teller recorded a duet of the song in 1999? I actually recall Penn & Teller performing this as part of their act at the MGM Grand in the ‘90s. The song appears on the album Tattoo Of Blood by The Captain Howdy. An MP3 can purchased on Amazon.com for .89¢. Lyrics can be found on Deborah Harry’s website.